Poland's Prime Minister Beata Szydlo arrives at the EU summit meeting in Brussels, Belgium, October 19, 2017. WARSAW - Poland’s Prime Minister Beata Szydlo will reshuffle her cabinet soon, she said on Tuesday, declining to respond to speculation on whether her own job might be at risk. On Monday, weekly Sieci Prawdy suggested Szydlo might be replaced by Jaroslaw Kaczynski, the leader of the conservative Law and Justice (PiS) party that they are both members of. Tabloid Fakt said on Tuesday that Szydlo was likely to keep her job, but that others including Foreign Minister Witold Waszczykowski and Environment Minister Jan Szyszko might be replaced. 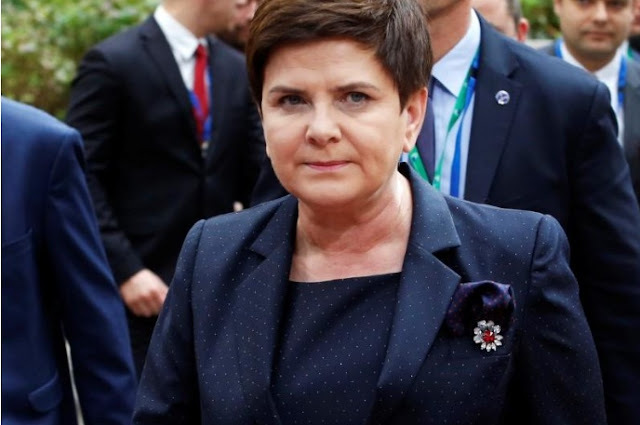 Szydlo fired her finance and treasury ministers a year ago, since when Polish media have been speculating that several other members of the cabinet, including the prime minister, might lose their posts. PiS leader Kaczynski exerts huge influence behind the scenes and media have said he might be targeting Szydlo’s job ahead of national elections due in 2019. “I do not want the speculation regarding changes in the government to continue. My decisions will be announced soon,” Szydlo told private broadcaster TVN 24. Asked about her own possible departure, Szydlo said she did not want to speculate, adding she was not tired or burned out. Opinion polls show Szydlo is one of the most popular politicians in Poland. The PiS, which has divided opinion at home and put Poland on a collision course with the EU with policies including increasing control over the judiciary and media, also enjoys continued strong backing from almost 40 percent of voters. That is attributed mainly to a generous program of social spending. Poland’s Prime Minister Beata Szydlo will reshuffle her cabinet soon, she said on Tuesday, declining to respond to speculation on whether her own job might be at risk. On Monday, weekly Sieci Prawdy suggested Szydlo might be replaced by Jaroslaw Kaczynski, the leader of the conservative Law and Justice (PiS) party that they are both members of.